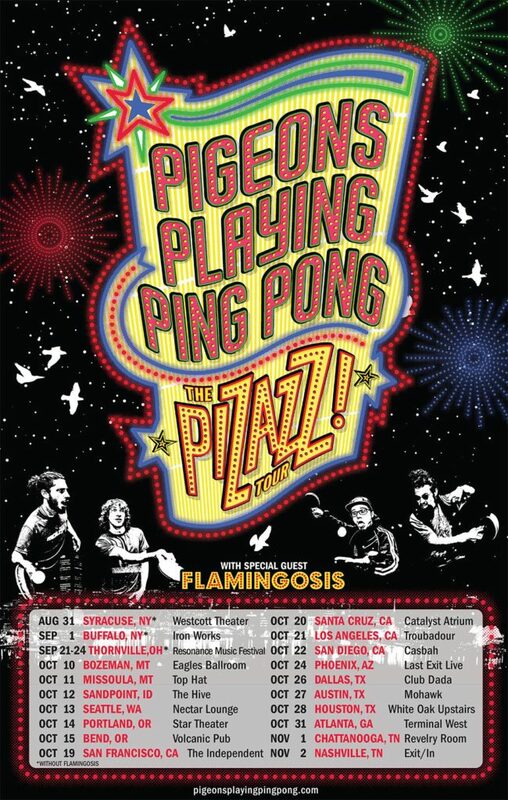 Close the doors, buckle up and get ready for a wild ride, because our favorite Maryland funkateers just announced ‘The Pizazz Tour.’ Featuring Flamingosis and leading up to their upcoming studio album release Pizazz, this tour will see Pigeons Playing Ping Pong’s return to the West Coast and a special Halloween run through Texas and Atlanta! If you have not heard of PPPP, this infectious and enthusiastic quartet of musicians has been heating up the country’s hearts with their winning combo of psychedelic new-age funk sound infused with their old school passion and live performances. They just wrapped up their 8th successful Domefest in Bedford, PA, and extensively toured the U.S. last Spring (we caught them in Austin last February–read about it here). We cannot wait to catch them on the road, joined in majority with another CYM favorite, Flamingosis. The ‘Pizazz’ sure is strong in this flock. Will you join this flock of flying funkateers? More tour dates will be announced and info can be found here.